So you've taken a class, purchased your hive and spring is right around the corner. Now what? Let's take a look at how to populate those hives! With these things in mind, here is a breakdown of the three most common ways to get your hands on some bees! Bee packages are the most widely available option and can populate any hive style (this is important because nucs are hive-specific). They contain several thousand worker bees and one mated queen, and they are sold by weight, most commonly in 3-pound and 6-pound options. Packaged bees are shaken together from multiple hives, funneled into a small crate and supplied with a can of sugar syrup to eat during transport. The queen is suspended from the top of the package inside a small cage, which allows the workers to familiarize themselves with her scent before being installed. When choosing a package supplier, you will have options with respect to bee strain, treated or treatment-free, hygienic genetics, and package weight. We recommend looking for a local source of hygienic bees with both general hygienic behaviors and VSH (Varroa-sensitive hygienic behavior). If you plan on being a treatment-free beekeeper, starting with a treatment-free package is advised. If you are unable to find them, it is recommended that you learn which treatments the supplier used and slowly wean your bees off the chemicals over the course of several months. If you plan on starting your hive in the spring, you should begin to look for package options in the fall or early winter. Most packages are made available for pre-sale at this time and should be reserved as early as possible because they tend to go quickly! Note that if you reserve your package in the winter, they will not be available for pick-up until spring. To learn more about packages, check out the Low Down on Bee Packages. 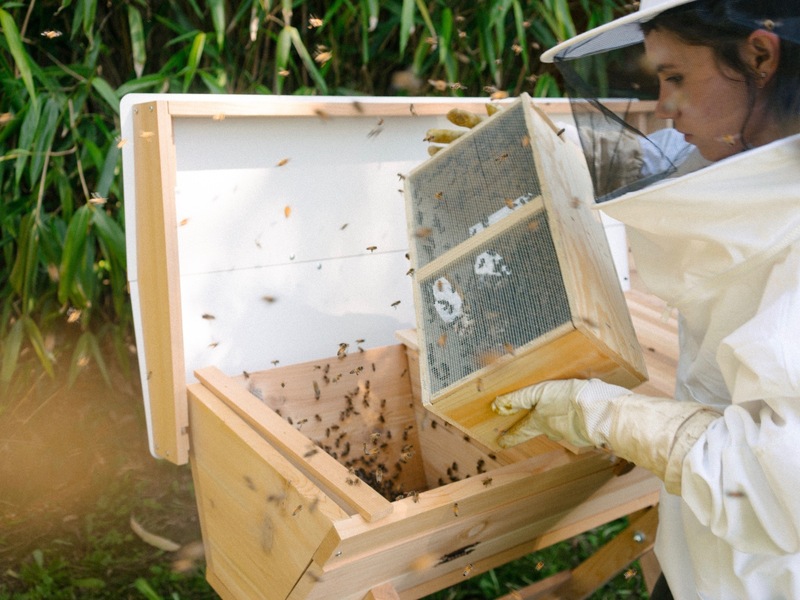 Nucs (short for nucleus colonies) are mini, fully-functioning beehives. They contain one queen, workers, brood and food stores on 4-5 frames of comb. This is the most popular method of obtaining bees, and have developed alongside the current most popular style of hive - the Langstroth. Nucs commonly come equipped with deep Langstroth frames, but alternative nuc styles, like top bar and Warre nucs, are slowly becoming available. Nucs are a great option for beginning beekeepers, as they are very easy to install. You simply transfer the combs into a compatible hive which gives the bees a big leg up in establishing their colony in a new place. Nuc colonies already have everything the colony needs, which puts far less stress on the bees (and on you)! When choosing a nuc for your hive, follow the same guidelines as when choosing a package provider. Nucs, like packages, are usually available for reservation in the winter, and pick-up is usually set for early spring. Remember: the more the local the source, the better off your bees will be! Only compatible with Langstroth hives, unless you have found a source that is specifically preparing nucs for top bar or Warre hives. Wanna earn some beekeeping street cred? Populate your hives with swarms. Swarms are hands-down our favorite way to get bees! They are free (if you catch them yourself), can be installed in any hive design and are already acclimated to your area. Also, swarms have the added benefit of coming with some honey and nectar that is tucked away in the workers’ honey crop (this gives them a jump start when building comb in a new hive)! Swarms occur when a hive runs out of space for the growing colony. The queen will stop laying and her caretaker daughters will stop feeding her, in order to lighten her up in preparation for flight. In addition to this, the worker bees will start to raise several new queens. Once the colony is ready to the swarm, the queen and about a third of her eldest workers will leave the hive and collect in a cluster, while the new queen bee will take over the original colony. Scout bees on the outside of the swarm cluster will search for a new hive location and come back to the cluster to report their new digs. To obtain a swarm, you will either have to capture it yourself or know of other local beekeepers collecting and selling swarms. Many local beekeeping clubs and associations have swarm lists that you can participate in, allowing you to receive alerts if there is a swarm nearby. There are also online resources such as BeeAllies.com that allow you to receive either phone call or text when a swarm is reported. At first glance, swarms can be pretty intimidating, because let's face it - thousands of stinging insects clustered into a ball is the stuff of nightmares. Despite their ominous appearance, swarms are generally very docile. Without food, brood or a physical hive to protect, they are not in a defensive state. Honeybees in swarms will also have a difficult time stinging, because they have filled themselves to capacity with nectar or honey before leaving their original hive (think about doing sit-ups after a big Thanksgiving meal... oof). Swarms season begins shortly after the bees in your area start emerging for spring. Swarms will continue through spring and into summer, but swarms found later in the season may not have enough time to build out comb and store sufficient resources before the winter. Late swarms do require additional support, like feeding, and will often fail anyway. A hive that swarms late in the season may also indicate a problem with the colony such as disease or a heavy mite load. These swarms may be better off left alone. Once you've figured out which option is most appropriate for your situation, you can start to narrow down bee suppliers through online searches, contacting your local beekeeping organization, and/or registering on a swarm list. Solomon Parker has compiled an excellent directory of treatment-free bee suppliers nationwide - check it out here.